The Boatshed café/bar brings a Mediterranean ambience to the park. Situated on the white sands of the estuary channel, the Boatshed is open right through summer. It's your first stop for croissants and coffee or that big hearty breakfast and you can catch the morning rays of sunshine on the outdoor rooftop sundeck or stay undercover in the shady verandah of the dining area. Enjoy cool drinks from the bar, and big platters of european inspired pates, olives and specialty breads mixed with unique Nelson flavours of mussels, salmon and venison. Or make a candle-light night of it. 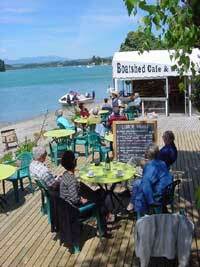 The Boatshed offers unhurried dining with a superb range of all that Nelson is famous for. In season seafood like oysters, scallops, blue-nose or snapper, deliciously prepared meats, tasty vegetarian dishes and desserts that make indulgence irresistable. Some of Nelson's finest award winning vineyards are located close to Mapua and the Boatshed offers a variety of acclaimed chardonnay, riesling, pinot noir and cabernet sauvignon. While the cuisine is very special, the prices reflect the Mapua Leisure Park's determination to make the best services affordable to all and younger campers are not forgotten - with all the meals they love.